What Is DA Form 7349? 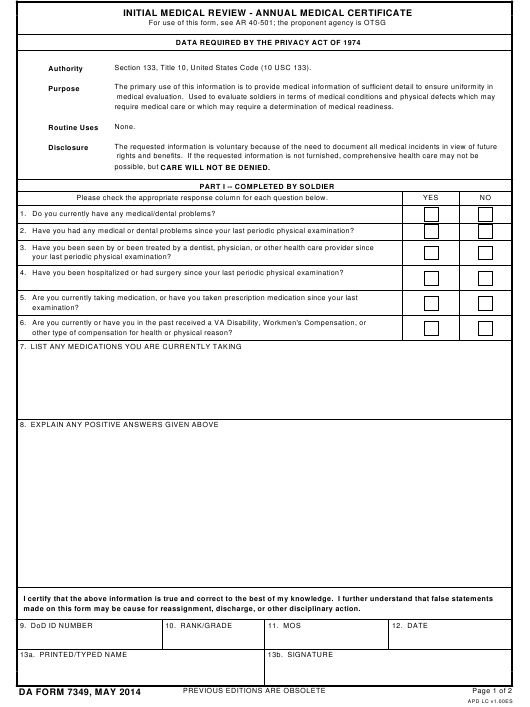 DA Form 7349, Initial Medical Review - Annual Medical Certificate is a form used for diagnosing the soldier's medical conditions to determine any healthcare-related problems that may require special care in the future. The form also provides detailed medical information to make sure that all medical procedures are properly coordinated. The latest version of the form - sometimes incorrectly referred to as the DD Form 7349 - was released by the Department of the Army (DA) in May 2014. An up-to-date DA Form 7349 fillable version is available for digital filing and download below or can be found through the Army Publishing Directorate website. The DA 7349 can be used to record results of annual health screenings of Ready Reserves members. The DA Form 3725 or the Army Reserve Status and Address Verification is a related form used to during annual medical examination of Individual Ready Reserve Soldiers. How To Fill Out Da Form 7349? Section 133, Title 10, United States Code (10 USC 133). require medical care or which may require a determination of medical readiness. possible, but CARE WILL NOT BE DENIED. Please check the appropriate response column for each question below. Do you currently have any medical/dental problems? Have you had any medical or dental problems since your last periodic physical examination? your last periodic physical examination? Have you been hospitalized or had surgery since your last periodic physical examination? other type of compensation for health or physical reason? made on this form may be cause for reassignment, discharge, or other disciplinary action. Part I is completed by the soldier. It contains a questionnaire with six yes-or-no questions that have to be answered by the soldier themselves. Each positive answer requires a further explanation in Box 8. The soldier has to list all medications they are currently taking in Box 7. Failure to provide full information might lead to difficulties in receiving comprehensive health care, but care will not be denied either way. The bottom lines of the page require identifying information. This includes the service member's printed name and DoD ID, their rank or grade, MOS, a signature and the date of filing the form. Part II is filed by the initial reviewer. This part contains the initial notes of the examination. The reviewer has to decide whether the Soldier is medically ready for duty or requires a further evaluation. This part of the form requires the date of the review and the signature of the reviewer in Boxes 16 and 17. Part III is filled in by a physician. All comments are listed in Box 18 and the results of the soldiers readiness evaluation is provided in Box 19. The physician must complete Box 20 with the PULHES using the Physical Profile Functional Capacity Guide in Table 7-1 of AR 40-501. Box 21 specifies whether the Army Physical Profile (DA Form 3349) is attached to the submitted certificate. PULHES stands for general physical condition, the upper and lower limbs condition, hearing, sight, and physiatric condition. Part IV is filled by the approving authorities and requires a recommendation based on the results of the examination along with the date and signature of the authorized official.